The beautiful and untouched landscape is the absolute protagonist in Valdorcia. This area of Tuscany boasts of endless rolling hills covered with grain or sunflowers, a rich green valley which encompasses the Orcia river, from which the zone derives its name, and don’t forget the vineyards for the renowned wines of Brunello and the newcomer on the market, the Val d’Orcia DOC. It is no wonder that this territory, which stretches along the provinces of Siena and Grosseto, is protected as a World Heritage Site by UNESCO. Time seems to slow down for picturesque towns like Pienza, a real jewel known as the "Ideal City" and the beautiful Palazzo Piccolomini. Or the little town of Castiglion d'Orcia with its fortress. At the furthest southern most point there is the hilltop town of Radicofani with its imposing castle tower or go west, towards the walled medieval city of Montalcino and the vineyards of Brunello. A must-see is the beautiful and suggestive Romanesque Abbey of Sant' Antimo, one of the best examples of medieval monastic architecture. After a day visiting museums, ancient abbeys and castles, you can relax yourself in one of the many thermal baths of the region, such as the ones in Bagno Vignoni or in Bagni di San Filippo. This region is very rich in high quality local products such as the "pecorino" cheese of Pienza (a typical cheese made with sheep's milk), the genuine olive oil, the gorgeous wine resulting from a long and ancient tradition, saffron, mushrooms, chestnuts, truffles, game and a lot of other specialties along the wine road. A vacation in Valdorcia is a special journey between sweet tastes and marvellous panoramas that you will never forget. The most beautiful photos you see of Tuscany come from this paradise! Art, history, nature & wine are the obvious reason why you should make Val d’Orcia in Tuscany your base for holiday accommodations. But we got a few extra you might not even realize, read here for great reasons from experts who live in Tuscany. 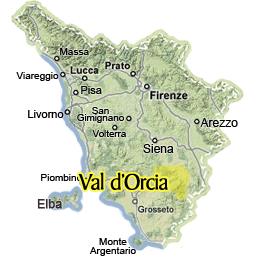 Spending a day in the Val d’Orcia? We highly recommend enjoying a lunch or dinner here as you explore the small medieval town near Pienza. Take time to also stop outside of the town to enjoy breathtaking views of the Tuscan landscape. Don’t miss the magnificent Montalcino, the city of the great Brunello wine, on your vacation to Tuscany. Here are our suggestions on what to see and do in Montalcino. In Pienza, we highly recommend visiting Palazzo Piccolomini, the first example of Renaissance architecture. With its terrace and hanging garden, you'll enjoy an incredible view of the surrounding Val d'Orcia landscape. Discover the beautiful outdoor hot springs at Bagni San Filippo in southern Tuscany along the eastern skirts of Monte Amiata. Hot water at the source makes it possible to bathe even in cold seasons - and the spectacular White Whale needs to be seen and enjoyed! Monte Amiata, the highest mountain in the south of Tuscany, offers activities year-round as well as a wonderful view over the Val d'Orcia from its peak. If you are near Montalcino, make sure to head to and visit this beautiful Romanesque abbey said to be from the time of Charlemagne. Its beauty will enchant you! Typical Tuscan decor with a fireplace in all 6 self catering holiday apartments creates a special atmosphere & base for your vacation near Siena, free thermal pools, the via Francigena & the vineyards of Montepulciano. Thermal water spas are a refreshing reprieve in a hectic schedule touring the Tuscan countryside. Tuscany and its extinct volcano, Amiata, provide the heat for the many hot springs where one can enjoy the revitalizing and sometimes healing waters.